The dust left Africa a few days ago and believe it or not, it can be seen from the sky. 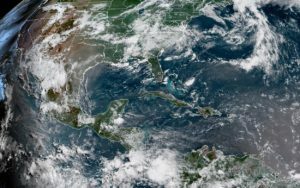 That’s how much dust is coming to Texas and other states in the U.S. The dust is not dangerous for Texans but it does affect people with allergies. The dust particles are tiny and can enter people’s lungs. If you suffer from allergies, make sure to take precautions and stay indoors as much as possible. The dust cloud also has its effects on the weather. Even though we are in the summer and temperatures in Texas have been reaching and surpassing the 100-degree mark, the dust will make our days even hotter. Be careful, especially if you have kids with allergies. Allergies might get worse during the next days so limit your outdoor activities.